Landholders can collect a proportion of the rainfall run-off from their property in one or more dams on non-permanent minor streams, hillsides and gullies without a water licence, water supply work approval, or water use approval. In the Central and Eastern Divisions of NSW, up to 10% of average annual regional rainfall run-off can be captured. 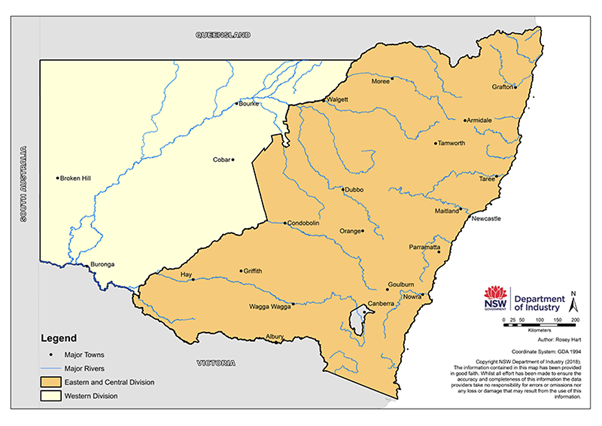 In the Western Division of NSW, all rainfall run-off can be captured. The boundaries of these harvestable rights areas are shown in the map below. the method for calculating the harvestable right water available from a dam which is also used for other water rights (a 'mixed right dam'). The current Harvestable Rights Orders are available in the NSW Government Gazette number 40 dated 31 March 2006 at pages 1628 to 1631. Information about the total dam capacity allowed under harvestable rights for your property, and where you can build a dam without a water licence or approval, is available on the WaterNSW website.